I wish I would have captured a shot of the faux-stone archway leading into the gameplay area. Upon it were the many accolades that Dark Souls had earned at E3. You see, when mega-sites award games "Best of Show," or "Most Anticipated Game," or something like that, they actually hand out a ribbon or other physical representation. The people showing the game then proudly post their awards for all the adoring public to see. The archway above the the entrance to Dark Souls was positively covered with them. But there was still no line. Why? Because people don't like getting their asses kicked in public, that's why. Dark Souls is of course, the "spiritual successor" to the infamously difficult Demon's Souls. I still don't know exactly what "spiritual successor" means, but I do know the game looks the same, if not better, it controls the same, the sounds are the same, and everything is still more than capable of making you dead. I got killed by emaciated grunts, beefier soldiers, heavily armored knights, a giant steel-clad boar, and a fire breathing "wyvern." The messages (yep, those are back) called it a "wyvern," but it looked like a damn red dragon to me. At least that's what I could make out through the sea of flames that washed over me. And yes, every time I died everything respawned. "Spiritual successor?" They may as well number the first level 6-1 and get on with it. If you were a fan of Demon's Souls, this game should not disappoint you. The differences I noticed were minor. There were only six classes to choose from for the demo. One of them looked like the guy in the above photo. Guess who I played as? Yeah, he was awesome. The health items were called something other than "grass." There wasn't a Nexus, or hub world. When I died I respawned in body form. If I could make it back to my bloodstain (yep, bloodstains are back) without dying I'd reclaim all of my lost souls. I asked if the souls were your XP and currency, like the last game. I was told they were still trying to work that out. I didn't see any other form of money or XP, so I will tentatively say that souls are definitely your XP and currency. The bonfire will act as... something. It's kind of like a portable Nexus, but not really. 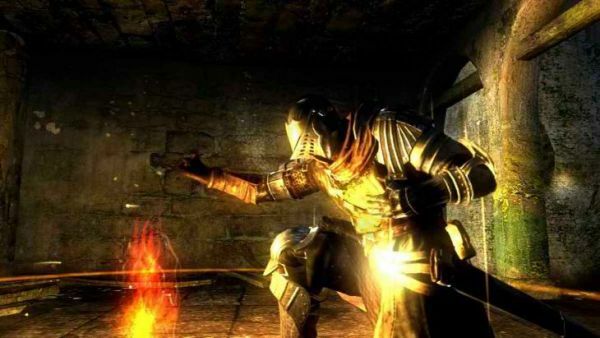 Namco Bandai's Nobuaki Taguchi talked with me about Dark Souls. He modestly claimed to not know much about the title, and then proceeded to answer most of my questions and provided a wealth of information. He did note that some of this information may change as the game continues through development. We discussed the bonfire system and the lack of a Nexus. Since this game isn't really a sequel to Demon's Souls, (even though it kind of is) the Nexus wasn't viable. The developers came up with the bonfire system. I'm not exactly sure how it works, but it will refill you life bar. Oh, and there's no MP. Did I forget to mention that? I didn't see a magic user. I'm not saying it won't be there, I just didn't see any in my time with the game. Back to the bonfire: Every time you use it to replenish your life, the enemies respawn and get stronger. Why? Because the makers of this game hate you, that's why. You can also strengthen the bonfire, but this will cost you some of your humanity. Why do you want a stronger bonfire? Who cares about humanity? Nobuaki wouldn't say any more on the topic. I asked him if we could summon players. Yup. I asked him about invasions, he said yes, invasions are back. He explained that you can have up to three players in your game world. This is similar to Demon's Souls, because you could have two allies (Blue Phantoms) and one uninvited invader (Black Phantom) enter your game world. Nobuaki then explained that in Dark Souls you could invite thee allies into your game. This would prevent a black phantom from invading. He mentioned that this was in effect only for the E3 demo, but the developers may leave that mechanic in as a co-op feature. I'm saying that it sounds exactly like a certain character from Demon's Souls. Nobuaki also talked about a new way to harass your fellow players - "Infection." Now you don't have to be an overt jerk by invading someone's game. You can use a bit of chicanery. Players who want to grief others, but are too cowardly to invade as a Black Phantom, can initiate an "infection." Nobuaki didn't go into specifics about how this will be activated, but in essence the infector will increase the difficulty of three other players' games, making the enemies tougher and more aggressive. I have no idea what's in it for the person doing the infecting, other than being a jerk. I'm sure it benefits them somehow, in some jerk way. The downside to infecting games is that the infector leaves his world open to those he infected. So the three "infected" players can enter the his world and try to kill him. I don't know if this feature will be optional, but it looks as if From Software, the developer of both Demon's Souls and Dark Souls, got their co-op in their versus again. I didn't need to ask Nobuaki about the difficulty of the game. He proudly offered up this bit of information: The developers had designed this particular demo specifically for E3. It was possible to complete, but they didn't think anyone would be able to finish it. Six people made it through the demo. The developers are taking this personally, and are working to make the final retail release even more difficult. So six people screwed it up for the rest of us. Thanks, whoever you are. 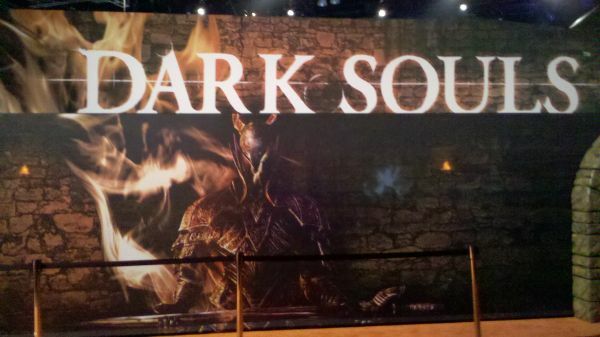 Dark Souls will crush your will to live on October 4th. It will be available on the PlayStation 3 and Xbox 360, and hopefully it will support 4 player online co-op.